BERLIN — Daniel Caligiuri scored twice to earn Schalke a 2-1 win over Wolfsburg, giving the home side a positive start to the second half of the Bundesliga on Sunday. Schalke had been hovering just above the relegation zone during the Bundesliga's almost four-week winter break, and Caligiuri's late second goal - set up by American midfielder Weston McKennie - helped the side climb to 12th after the 18th round. However, coach Domenico Tedesco's decision to drop regular goalkeeper Ralf Faehrmann for the 22-year-old Alexander Nuebel, and uncertainty over general manager Christian Heidel's future, will likely mean the turbulent times at the Gelsenkirchen-based club continue. Caligiuri got the home side off to a good start with a penalty in the eighth minute, only for Elvis Rexhbecaj to equalize on a rebound with his first Bundesliga goal in the 20th. Wolfsburg had dominated the first half, but Schalke recovered after the break and Caligiuri punished the visitors for some passive defending in the 78th. McKennie picked up his fifth yellow card and will be suspended for Schalke's game at Hertha Berlin on Friday. Slovakia midfielder Ondrej Duda's two late goals gave Hertha Berlin a 3-1 win at promoted Nuremberg. Vedad Ibisevic scored Hertha's opening goal in the 15th and set up Duda's first in the 50th - canceling out Hanno Behrens' 42nd-minute equalizer - before Davie Selke helped Duda seal it with 20 minutes remaining. 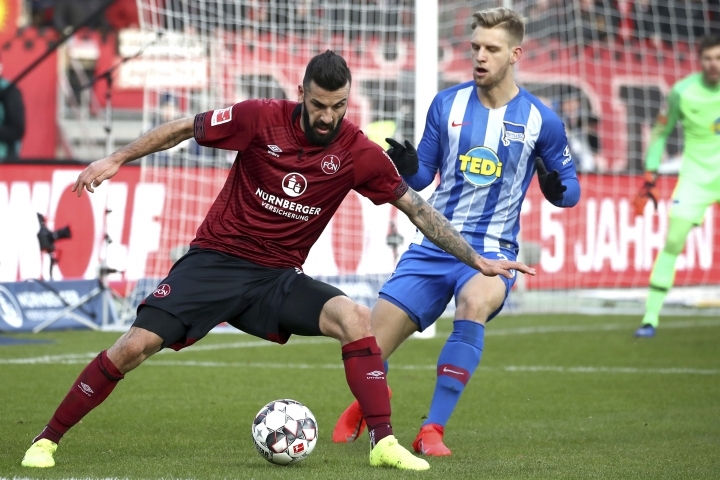 Hertha climbed to seventh with its first win in four Bundesliga games, while Nuremberg remained last after its 11th defeat from 18 games.